The $75,000 ATP Challenger will be held from 7 to 14 July 2018. The field is led by World No. 113 Tim Smyczek. The 30-year-old US-American will open his title bid against compatriot Tommy Paul. No. 2 seed will be Bjorn Fratangelo, who will take on JC Aragone in another all-US-American affair. Ramkumar Ramanatha of India will be the tournament’s No. 3. He will start his campaign against Evgeny Karlovskiy from Russia. Fourth favourite Jason Jung from Taipei will face US-American wild card entry Thai-Son Kwiatkowski in the first round. It is also the first hard-court Challenger of the summer season. 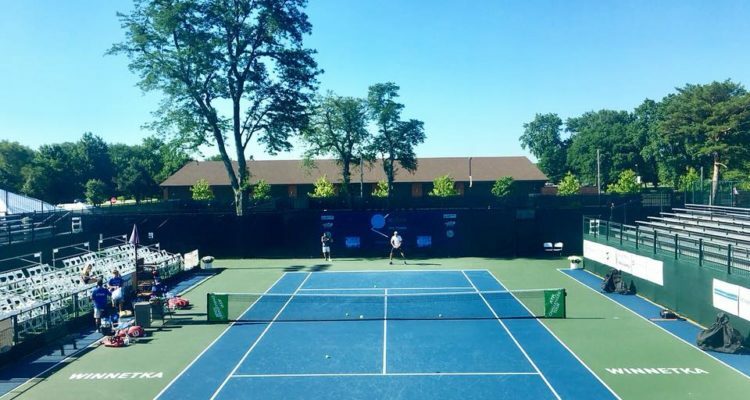 Winnetka is one of two ATP Challenger events this week kicking off the men’s side of the US Open Wild Card Challenge, which will award a men’s and a women’s wild card into the 2018 US Open by utilizing hard-court pro tournaments this summer. Both the men’s and women’s challenges—the women’s side begins this week with the $60,000 USTA Pro Circuit event in Honolulu—conclude the week of Aug. 6. For the men’s challenge, USTA Player Development considers all US-American results worldwide at the Challenger level and above. Therefore, both USTA Pro Circuit tournaments (including Winnetka) and international ATP World Tour and ATP Challenger events on any outdoor hard-court surface over the next five weeks will be included. The US-American man and US-American woman who earn the most ATP World Tour and WTA ranking points from their best results will earn main draw wild cards into the US Open. The men’s challenge will include the best three results during the five-week time period. Only US-Americans who did not otherwise earn direct entry into the US Open are eligible. In the event of a tie, the player with the best ATP or WTA singles ranking on August 13 will be awarded the wild card. This entry was posted in ATP Challenger News, ATP Challenger Tour and tagged ATP Challenger Tour, Nielsen Pro Tennis Championship.